Where did this stereotype come from? It all started with late-Romantic era composer Richard Wagner, whose famous Ring Cycle required more sound out of singers and instruments than ever before. He particularly loved to use copious amounts of loud brass in his operas (the Wagnerian tuba was actually invented for his music), which meant that all of his singers had to be powerful enough to pierce through a huge orchestra, which now included horns, tubas, trombones, trumpets, and just about every other loud instrument that existed. All without a microphone too! Not only because this was opera, but also because it was during the late 1800s and microphones had not even been invented yet. At the time, singers had not needed to produce as much sound as Wagner required, so fewer singers had the training or even the physical strength and size necessary to be heard over this new type of orchestra. The singers who were capable of such a feat tended to have larger rib cages that could expand wide enough for air to resonate through and soar out to the audience. Acoustically, air that has more surface area to bounce off of sounds louder to the human ear—what opera singers call resonance—and can thus be easily heard. These few specialized “Wagnerian singers” soon became a hot commodity in the world of opera, but it also made them appear much larger next to other opera singers. 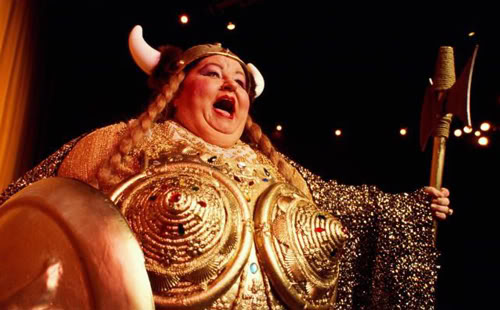 The phrase, “It ain’t over ‘til the fat lady sings,” directly refers to the finale of Wagner’s opera Götterdämmerung, which ends with the (very loud!) soprano character Brünnhilde, a warrior goddess traditionally costumed with a spear and winged helmet (the horns were first associated with Vikings, and added to her later), bringing the house down with a killer aria. 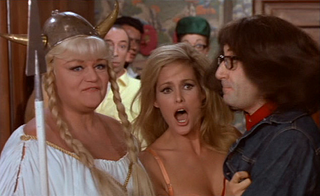 As Wagner’s operas gained more and more international popularity, pop culture has associated this image with opera singers everywhere. I am all for playful pokes at stereotypes, but the amount of times I’ve been told, “You’re too tiny to be an opera singer”—yes, actual words that have been spoken to me!—or, “Whoa! But opera singers are supposed to be fat!” is getting a little old. Though the now-popular stereotype represents only one specific body type, in reality, opera singers come in all shapes and sizes! When your body is your instrument, there’s basically no way to sound exactly the same as someone else because no one else has your instrument. Part of the reason why many aspiring opera singers, including myself, love the art form is because every voice is unique, and each singer can bring their own kind of magic to a role. 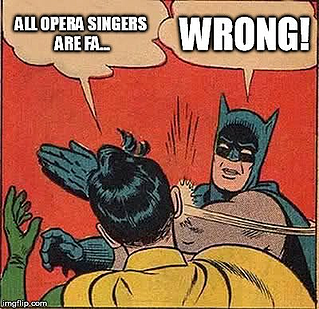 It’s ironic that the opera stereotype is of a heavily overweight singer because opera is incredibly physically demanding. Remember, opera singers have to be able to sing over an entire orchestra without a microphone, and that’s in addition to their stage movements! Standing rigid and singing is no longer the norm. 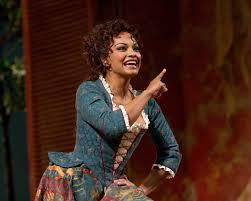 Opera singers must also be skilled actors delivering sung text while walking, running, fighting, and even dancing. Opera singers are the Olympic athletes of the vocal music world. It takes years and years of intense training, requires incredible discipline, and only the most dedicated make it to the top. If a singer ignores their breath support for even a second, or tenses up before a high note, their voice loses resonance and will not soar over the orchestra to the attentive audience of thousands. In nerve-wracking, high stakes moments like these, opera singers must rely on their training and musical instincts. Opera singers continue to rise to meet the challenges of this centuries-old and ever-evolving art form both physically and technically with resilience and dedication. Of course, having your body as your instrument has its challenges. As a young singer it’s surprisingly hard to truly sing freely without putting unhealthy and potentially harmful pressure on the vocal chords. Many people learn to sing based on imitation of what we hear from famous pop, musical theater, or opera singers. When I first began to study voice, I wanted to be a mezzo-soprano and dazzle audiences with my sultry, dark voice while performing the role of Carmen. Now, I do not have a sultry, dark voice like Carmen. Yet I was so convinced that I could train my voice to be darker that I ended up stressing and misusing my vocal chords. It wasn’t until I admitted to constant vocal fatigue that I truly understood that what I was trying to force my voice to do was just not going to work. Imagine trying to make a bassoon sound like a trumpet! No amount of vocal training can physically change the size or shape of the vocal folds, resonator cavities, or rib cage enough to turn a singer into a completely different voice part. This realization was initially disappointing, but after I accepted that I was not going to be a mezzo, I was able to free up my voice and to find my own unique sound: a light, spritely soubrette. And you know what? I love being a soubrette soprano! I get to sing all the sassy maids and saucy peasant girls in Mozart’s operas, which is a whole lot of fun. By allowing my voice to be itself, I finally feel comfortable as a performer because I’m singing what my voice was meant to sing. So often, young singers get caught up trying to be just like their favorite singer, that they ignore the qualities of their physical instrument. To young singers who want to be just like their favorite stars, my advice is this: your voice already has its own unique and special sound. Just let it shine! Be you, because no one else can. Opera has never had just one type of singer. Opera singers come in all shapes and sizes. All different body types mean that there are all sorts of different voices, but one voice type isn’t better than the rest. In fact, a strong opera cast features many different types of singers coming together to make beautiful music as an ensemble. All singers should be proud of their voice because it is unique to them—whether or not they are classically trained opera singers. Hannah Fan is the BLO Education & Community Engagement Intern for the 2017/18 Season. She is a vocal performance and music education candidate at The Boston Conservatory. 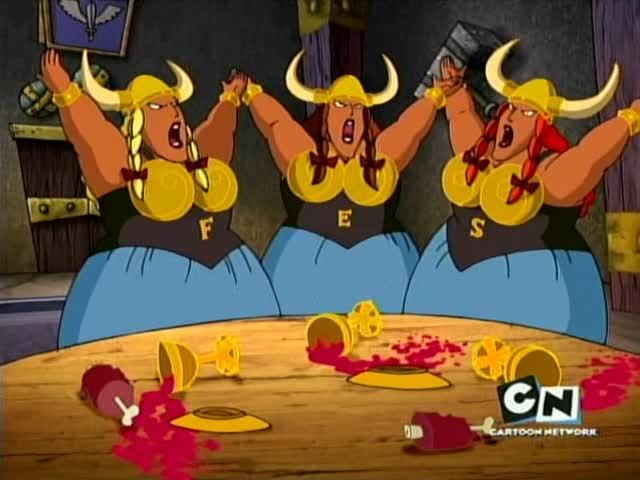 Images (top to bottom): The Valkyries from "Courage the Cowardly Dog," Cartoon Network; From the music video for "What's New, Pussycat" by Tom Jones; Danielle de Niese as Despina in Mozart's Così Fan Tutte at the Metropolitan Opera, Marty Sohl/Metropolitan Opera. Note: Blog Post has been edited from previous version. Die Walküre is the opera where Brünnhilde is introduced, Götterdämmerung is the opera with her notable aria.